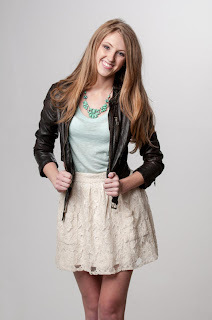 Barbizon Midwest Review: Abby Rockendorf's Inner Beauty Shines Through! Barbizon Midwest graduate Abby Rockendorf graduated from the Green Bay location at age 15 and was awarded "best attitude." According to Abby's mother, "Abby was pretty quiet before Barbizon but learned to be more confident, for sure. She has become aware that anything is attainable if you really want it. Although there were people that were skeptical about Barbizon, she still went ahead and gave it her best shot." Abby certainly has given her best shot and we are so proud of her success thus far. Although recently placing more focus on school, she has done a few runway shows with "Model Your Brand." Abby was also a contestant in the Miss Teen Wisconsin pageant this fall and qualified as one of the runners up! Although she didn't come home with the crown, she came home with a great group of friends and a lot of memories. Abby has big dreams and a bright future in front of her. Currently a junior in high school, Abby hopes to eventually get into law school. She continues to pursue her dream of modeling, not only because she loves it, but to help pay for college. So, what advice does this talented model and exceptional student have for current Barbizon Midwest students pursuing a career in the industry? "NEVER give up on your dreams. If you dream it, you can achieve it... You can't succeed if you don't try." Abby, we at Barbizon Midwest are incredibly proud of you. Your modeling career is off to a fabulous start and your academic goals are commendable. You are a girl of not only stunning outer beauty, but truly lovely inner beauty. We believe you can, and will, achieve your modeling and collegiate goals. We are always behind you and hope to support your bright future however we can. Keep in touch as we look forward to writing of your future successes!